'Tain't What You Do (It's the Way That You Do It) is a song written by jazz musicians Melvin "Sy" Oliver and James "Trummy" Young. It was first recorded in 1939 by Jimmie Lunceford, Harry James, and Ella Fitzgerald, and again the same year by Nat Gonella and His Georgians. The "shim sham" is often danced to the Lunceford recording of this song. "The Lunatics (Have Taken Over the Asylum)"
(1981) "It Ain't What You Do...."
The jazz tune was transformed into a pop song with ska elements in 1982. With the title slightly altered to "It Ain't What You Do....", it was recorded by Fun Boy Three and Bananarama, and was included on the former's self-titled debut album, but it was not available on a Bananarama album until 1988's Greatest Hits Collection. Terry Hall of Fun Boy Three owned a copy of Bananarama's previous single "Aie a Mwana", and after seeing an article about the trio in The Face, he decided he wanted them to sing background vocals on the song, solely based on the fact that he liked their look. "It Ain't What You Do...." became a big hit in the UK, climbing to number four in the UK Singles Chart, and achieving a Silver certification from the British Phonographic Industry. The success of the single also prompted Bananarama to return the favour and have Fun Boy Three sing on their next single, "Really Saying Something". In 2012, the cover version was used in a commercial for Hewlett-Packard's color printers, which aired in the United States. + A remix of "The Funrama Theme" with overdubbed brass, titled "Funrama 2", appears on the Fun Boy Three album Fun Boy Three. ++ The first 2:52 of the 12" version is the standard album version of the song, which is different from the 7". Some reissues of the album also include the "Just Do It" section as a separate track. ^ "Ella Fitzgerald Discography - Discography - Part 1". Archived from the original on 2016-08-08. Retrieved 2008-01-29. 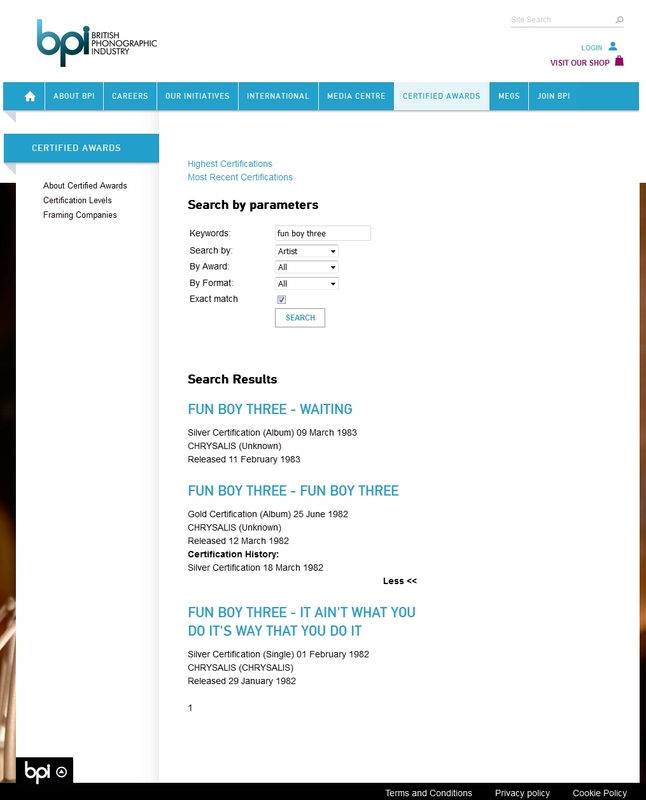 ^ a b "BPI > Certifications > Search results for 'Fun Boy Three' (from bpi.co.uk)". Imgur.com (original source published by British Phonographic Industry). Retrieved 2016-07-31. ^ a b "Official Charts > Bananarama". The Official UK Charts Company. Retrieved 2016-07-31. ^ Kent, David (1993). Australian Chart Book 1970–1992 (Illustrated ed.). Sydney: Australian Chart Book. p. 25. ISBN 0-646-11917-6. N.B. The Kent Report chart was licensed by ARIA between 1983 and 26 June 1988. ^ "Fun Boy Three with Bananarama – It Ain't What You Do..." (in Dutch). Hung Medien. Retrieved 2016-07-31. 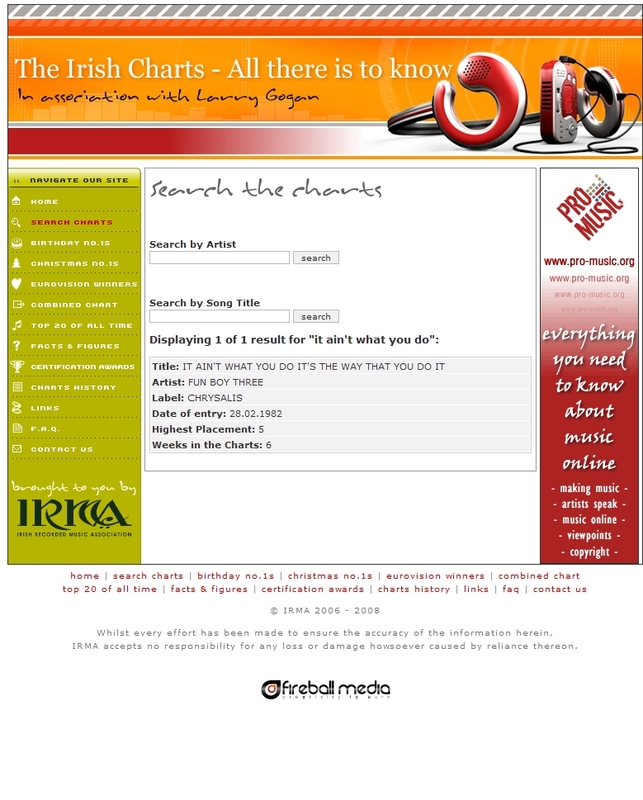 ^ "The Irish Charts – All there is to know > Search results for 'It Ain't What You Do' (from irishcharts.ie)". Imgur.com (original source published by Fireball Media). Retrieved 2016-07-31. ^ "charts.org.nz > Fun Boy Three with Bananarama – It Ain't What You Do... (song)". Hung Medien. Retrieved 2016-07-31. This page was last edited on 18 November 2018, at 03:48 (UTC).